Math can be made fun by using everyday objects as manipulatives. Hey all! So do you ever just collect things for no reason and then think "what should I do with these?" Um, me neither? Oh fine. I do. And one thing I kept for no reason were these little plastic tags from packages of bread and rolls and things. I found that they make great, cheap math manipulatives. Sort! Give a pile to your preschooler and let them sort. Sort by color! Sort by size! Sort by shape! Sort by date on the tag! You get the idea. Plus if you let them sort into a muffin tin, these make a very satisfying "plink!" noise. 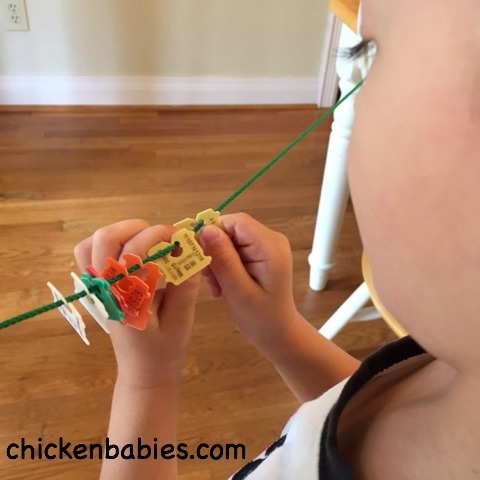 And they can be used for fine motor work. Here I strung up a shoelace between two chairs and Nathan clipped them on. He decided to make a pattern too. These are also great for counting, adding, subtracting, making patterns etc . . . 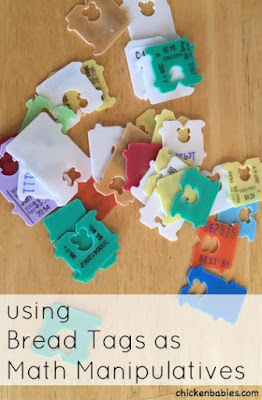 So start collecting some plastic tags for a cheap math manipulative at home or in your classroom. 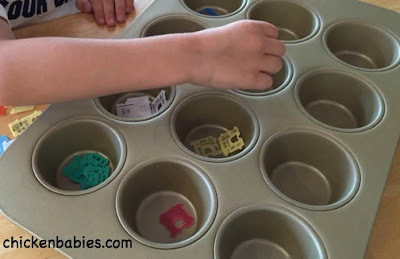 And be sure to explore the other fun math games we've done. If you liked this post, I'd love for you to sign up for my newsletter, or follow me on Facebook, Twitter, and Pinterest for more great ideas for kids. 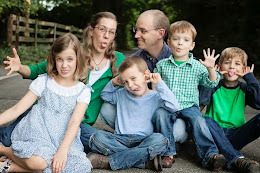 Follow Erin (Chicken Babies)'s board homeschool on Pinterest. This post is part of the "Math Made Fun" series over on Schooltime Snippets. Be sure to check out the other ways you can use everyday items for math! Thanks Kristina! My husband thought it was weird that I was keeping a collection in the back of our bread drawer, but they seemed like they should be fun for something so I kept them. :) Thanks for the comment.